Oochie, Owie, Yowie. Those are my biceps, triceps and trapezoids speaking. They have been getting quite the workout. Gardening can be physically intense, and I work up a serious appetite raking, dragging debris and edging my client’s gardens. I also have very little free time to cook these days, (this post should have gone up yesterday, but I ran into a bit of a sanfu entering information into TurboTax on Sunday, and well, Uncle Sam must come first). On the weekends, when I’m not working, I try to make a few hearty things in the kitchen to carry me through the week. I am a big fan of all Southern cooking -OK, who isn’t?- and I am especially fond of Lee Bailey’s country-style recipes. Cornbread has always been one of my favorite comfort foods, but although I think it’s fabulous drizzled with honey, I don’t like for the bread itself to be sweet! I prefer to to taste the flavor of real corn -very forward in this recipe- and I am picky about a moist, springy texture. 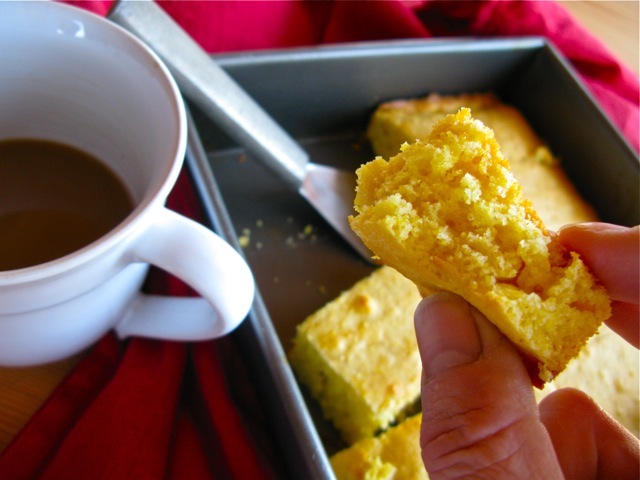 One of the things that makes cornbread special is its versatility. Sure, you can make it plain and simple -without the onions or peppers I mention here- but you can also really jazz it up with fresh things from the garden. Depending upon my main course, I might add chives, sweet onions, garlic, sweet or hot peppers, and just about anything else that strikes my fancy. 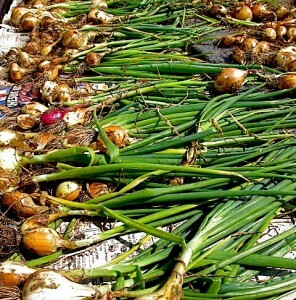 Sweet onions -such a rewarding crop to grow- are one of my favorite additions. It will be sometime before I have ripe, hot peppers in my garden, but they also add a special kick to this recipe – especially if you are cooking Cajun or Tex-Mex. 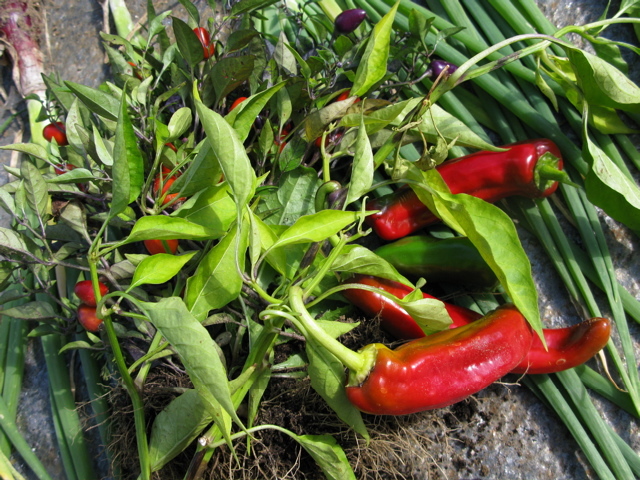 I will be talking more about gourmet peppers, and other potager-delights in the coming weeks. The recipe below is taken from Lee Bailey’s Country Weekends. If the gorgeous photographs of al-fresco meals in various outdoor settings don’t inspire you, the recipes and menus surely will. Although Lee’s beautiful book has gone out of print, I believe it can still be found online, both new and used. I received my copy as graduation/first-housewarming gift in the 90’s, (from a fabulous foodie-friend), and I still think it’s a wonderful book worth seeking out. And Hooo Wee. 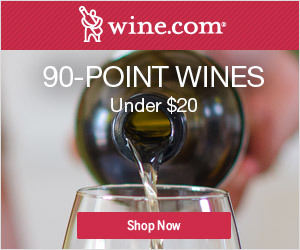 Try it with hot peppers, such as Jalapeños or Heirloom Hungarians, for an incredible kick ! § 9 Responses to A Coffee Break with Kick! Lee Bailey’s Sour Cream Corn Bread with Onions, Cheddar and Optional Hot Peppers…"
That sounds delicious. It will go wonderfully with the shrimp gumbo I’m making for dinner. Your posting was just in time. I’m looking forward to your posts on onions. I have no problem planting them, I just don’t know how to harvest. I ended up letting them spend the winter in the soil because I didn’t know what to do. I just cut the greens to use in a salad. Now I’m wondering if last years bulbs are still edible? Hi Carina ! There is a link in this blog post, (where I mention sweet onions in the text, the type is darker), click on that and it will take you back to last year’s post on harvesting onions. I’ll write more, but generally, you want to harvest when the green tops flop over. Usually the bulbs grow soft in the soil. You want to harvest them and then ‘cure’ in the hot sun. * PS Shrimp Gumbo sounds great… yum. You are making me want to crash your dinner party – but if you are Carina H… it would take me 3 or 4 days by car! I agree with Carina. This would go well with shrimp. And I KNOW you make shrimp creole – as I do. How yum that would be. But what about with fried chicken, and barbecued brisket, and creamed lima beans? Oh, this is making me soooooooo hungry – not a good thing as I sit at my desk with a container of no-fat Greek yogurt and an apple waiting in the refrigerator as my lunch. Oh, well. At least I don’t have tickets for the Yankees opener and have to sit outside on a nasty April day. I am just sitting down with my own Greek yogurt and granola for my very, very late lunch, (OK mine has LOTS of fat)! We must be on the same wavelength, (taste-bud length?)! Now I want shrimp creole. Sigh. OK. That will be the weekend menu. Fried Chicken. I think it’s also time for your fabulous fried chicken Virginia. Nice to hear from you :) I always love seeing your comments. I imagine it must be lovely in the city today. Michaela, it’s not lovely in the City today. The weather is gray and rather damp but not raining – yet. Although we do need rain in the spring, don’t we? And lots of trees, shrubs, and flowers are in full bloom. I am going to Amsterdam on Saturday and hope to see the fields of tulips, plus lots and lots of art, and eat some Dutch licorice so I am very excited. But it does mean I would be upstate for a few weeks so I am looking at your photos longingly. Oh! I’m sorry to hear that. It is cool here today, but bright and beautiful. Yes, we do need spring rain. I rather like gardening in light, misty weather. Amsterdam? Oh that sounds wonderful. I hope you have a lovely trip Victoria. I haven’t been to Amsterdam since 1998. Last time, I visited the art museums and went to several markets. One evening, I had the most amazing risotto, with spring vegetables, in a tiny restaurant on the water. The weather was gloomy, but lovely all the same. You are currently reading A Coffee Break with Kick! Lee Bailey’s Sour Cream Corn Bread with Onions, Cheddar and Optional Hot Peppers… at The Gardener's Eden.